Ridz and I are seriously planning of buying a bus. The interior will be renovated so we have spaces for beds, tables, mini-office, solat space, pantry, toilet. We’ll call it HOMESCHOOL COACH – yes, pun intended! Are we on the same frequency? Setelah hampir lima purnama tidak mengembara, akhirnya peluang untuk menjadi pengguna lebuhraya PLUS dan pelanggan Petronas pun tiba. Pack up, kids. We are off to Batu Pahat. Yok, yok. Lodging: Haji Marni & Family Guesthouse, Seri Beroleh. Strongly recommended! Each day Muhammad and Musa will complete three sets. Muhammad used to whine..tiba-tiba pening kepala bila kena buat Dr. Kawashima. Musa enjoys ‘academic’ stuff like this. Now, Muhammad’s latest time has improved to 7 minutes per set. BIIIG difference! Syabas son! Umi and Abi get a dose of training too when we check their answers. Just what the doctor ordered. 3. Peter dan adindanya Jane: This is for Maryam’s reading time. My girl is reading now, Alhamdulillah. Dunia terbuka luas dan cerah bila kita pandai membaca kan? She enjoys reading signage, billboards, labels..on the road la katakan. Bravo, Maryam! Readers are leaders. For the brothers, they use the advanced Peter and Jane series (the adventures yang melibatkan sepupu-sepupu P&J) for writing workout. They copy the pages (2-3 pages at a time). Good practice for penmanship, spelling, punctuation, vocab, plus FOCUS and PATIENCE. I missed the photo-shooting moment because I was too caught up in my nap. *thank you, painkiller* (nada sinis). What can you spot inside this van? Can see the banana tree, jr.? What about bags of kerepek? Can u spot the laundry too?
. 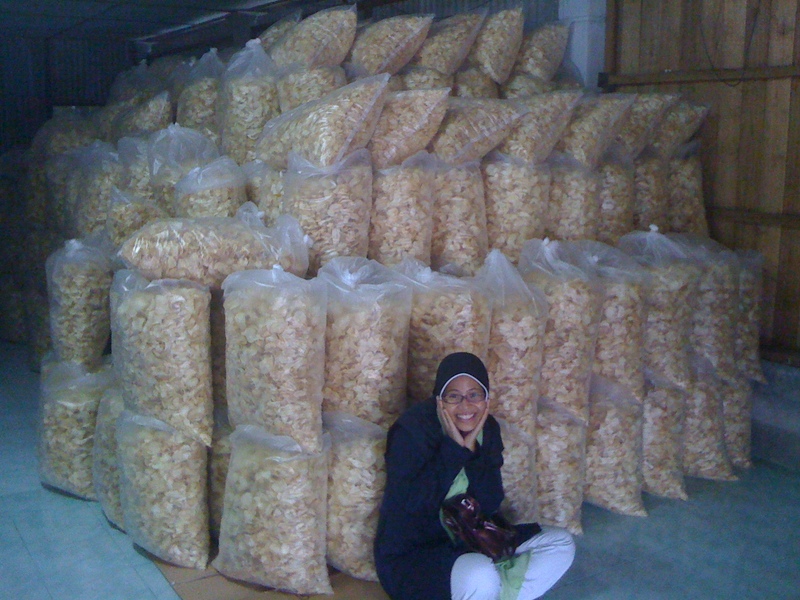 Speaking of kerepek, after our program in Parit Sulong, one of the English teachers took us to Kerepek Factory. No oompa-loompa like the ones in Willy Wonka, ya. Oh, pillows of kerepek waiting to be munched and crunched! Casa-Escuela kids and coaches arrived in Kota Bharu, Kelantan. 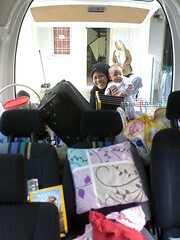 This is Sarah’s first trip to Darul Naim at the age of 4 months. 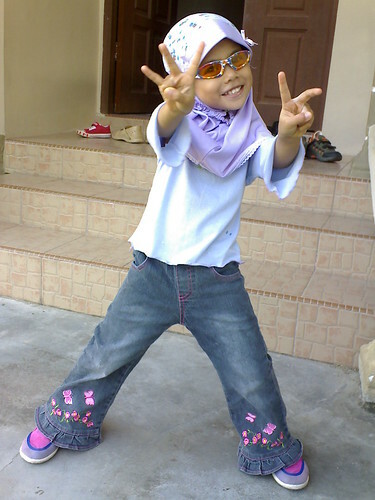 Hey, this is also Aisyah’s (our nanny/tutor) first trip to Negeri Cek Mek Molek at the age of…..20 somethin’. 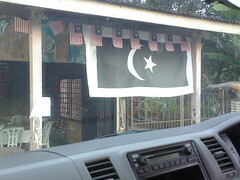 We stayed at Rumah Rehat Sri Anggerik in *WCY. A very spacious bungalow owned by Dr. Hisham, who operates his own clinic just across the street. 3 bedrooms, air-conditioned. Fridge, 2 rice cookers, a washing machine and a little TV available. We bring our own DVD player (always do). If any of you heading to KB and looking for a place to stay, e-mail me for Dr. H’s hp no. Maryam in her orange shades, feels at home in KB. Yati Ayam Percik, Jalan Long Yunus. The best ayam percik gravy ever! Burp..Alhamdulillah. Alhamdulillah…mi familia has safely arrived to Sri Kembangan from Kemaman. Wanted to buy kopok lekor and hadiah to all my blog buddies..but niatku tak kesampaian. Maybe next time, ok. If any of my dear readers heading to kemaman-kerteh-paka area, and looking for a place to stay, Kerteh Lodge has my vote. 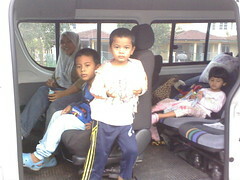 Every year, whenever our big van of fun has programs there, we’d make Kerteh Lodge our crib. 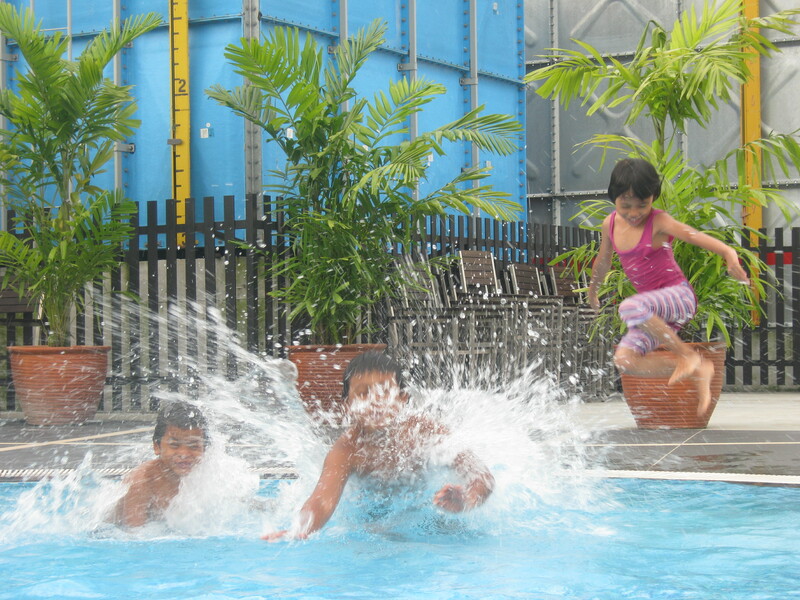 For only RM110 per night, you get a 2-room apartment, fully air-conditioned. Astro also available (minus movie channels). The kitchen is nice and clean. There’s a fridge and a big electric kettle provided. Rice cooker not provided (bawak sendiri le). McD is within a walking distance (the only one in Tganu so far, I think). For dinner, stalls are nearby. Oh, one more thing, if you do ‘hand-laundry’, the clothes will dry quickly (tpt sidai baju dekat air-cond compressor! hahah). Pictures coming soon. What to see in Kemaman-Kerteh? The ‘oil-refinery’ (not sure if this is the correct name). You can explain to your kids how the car gets its fuel. See, one topic covered for homeschooling! 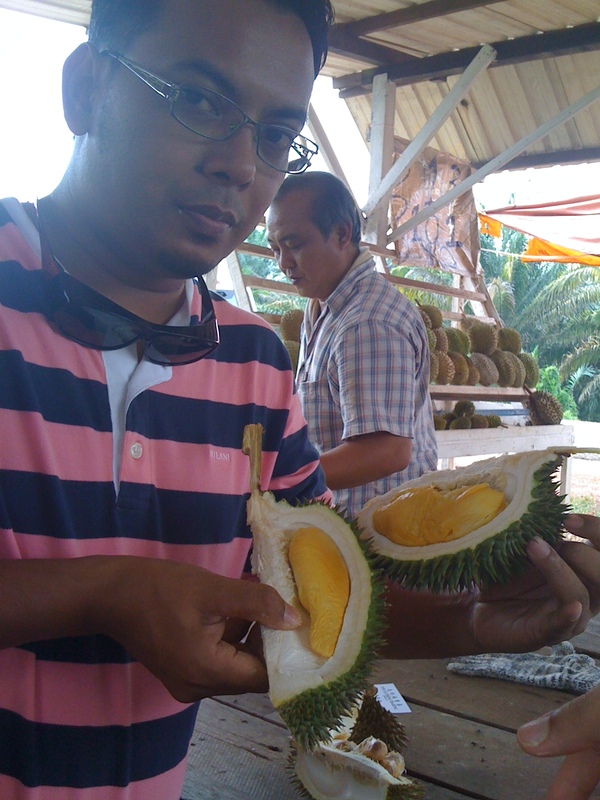 My lovely, lovely readers… well mi familia just got back from a week-long stay in Teluk Intan. ‘Berkampung’ at the rest house there. (Quite spacious, so suitable when traveling with kids. Plus, restaurants, 7-E, post office, CC, bundle shop are within walking distance.) Ridz and I had a blast doing our ESB seminar at SMK Tun Abd Razak, Selekoh (STARS). For the whole escuela!!! Form 1 until Upper 6 and the teachers and staff too. 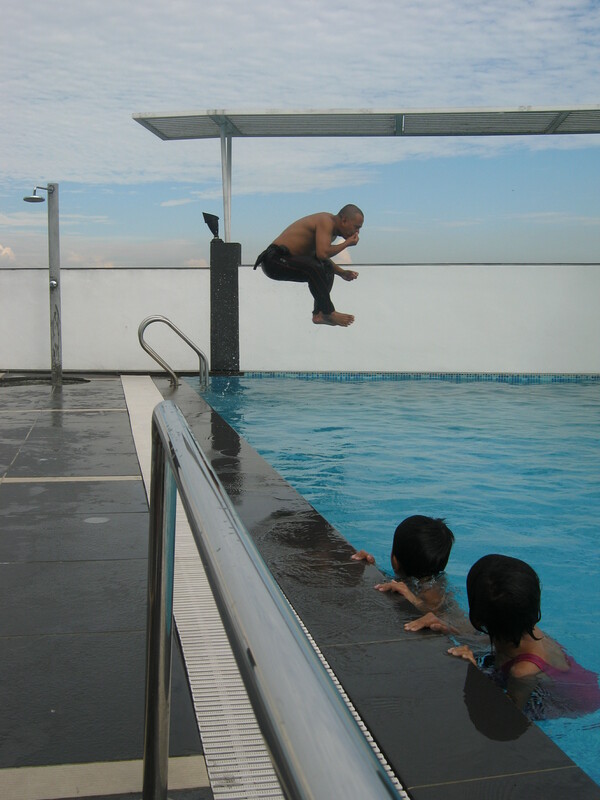 We went to STARS last year, during Ramadhan (yup, we do take bookings in Ramadhan). That was a few weeks before SPM 2007. The students who took part in ESB couldn’t get enough of it *wink*. Pn. Hjh Rahmah, the principal loved it. So, early January this year, she called me and booked us for the whole STARS population. By the way, when the SPM results came out last March, there was a 9% jump for English papers. (The school targeted 5% – so imagine how happy they were..are). Oh, I must mention that we had a guest speaker for ESB4Teachers and Upper-6 students – Dr. Rohayu. I must tell my readers that she did a superb job inspiring the pre-U students to go ahead and dream. Dream big. I caught some of the girls wiping away their tears. What comes from the heart touches the heart! Bravo Doc!!! Confession: She inspired me too (if you are reading this Doc, you are the best!) My goal – by November this year I must have registered for post-grad – PhD. Hmm…Dr.Sha.. sounds nice, kan? Ay caramba!!! Awwww…couldn’t make it to the smartkid exhibition at PWTC today (Sunday hopefully). 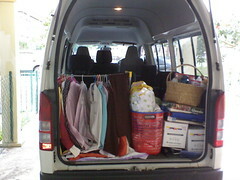 After ‘asr today, the big van of fun will leave the crib to go to Sungai Besar, right before Sabak Bernam. Everybody’s tagging along for this trip (as usual laah). Tomorrow evening, will be back home. Then Monday, off again to Diamond Gulf, Perak. For 7 days!! Yee-haaa.. But our routine once Hiace wheels start to roll – Doa for traveling, Salawat and Zikr – loudly. So, kiddos.. buckle up and ready for take off!